These roses have been made with air-dry clay dough called Cold Porcelain without using cutters. Roses may look complicated but are easy to make and look gorgeous in any color.They are also the most popular and well-loved flowers around the world. This is a Valentine Day gift basket , some dried ferns have been used to fill up the arrangement. 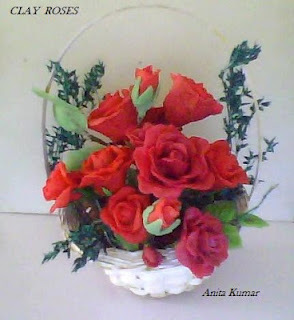 I am continuing my last years New Year Resolution of making practical use of my craft work and using it for decorative purposes like arranging these roses in a small basket!